Unification is a protocol that integrates two primary components: the public Mainchain and the hybrid public/private WRKChains. A network of 96 nodes approve the transactions on the public chain. Such a network evolves the concept of a PoS consensus to utilize a novel mechanism called Distributed Stake Governance (DSG). Every 3 days, 96 nodes from the 96 wallets that stake the most UND (Unification’s native token), are selected to govern the network; the chosen nodes verify the MainChain transactions and are rewarded with block rewards plus network fees. As any wallet that stakes enough UND to be in top 96 holding wallets can become part of the validation process, no single entity can control the MainChain. Moreover, if an elected node tries to validate a transaction or block that is not approved by the other nodes, it suffers a loss in reputation. A lowered reputation lowers the probability of a node being selected as a validator in future sets. Thus, it’s in the best interest of validators to properly execute their duties, else they risk the loss of block rewards due to lowered odds of being selected as a validator. Also, since the MainChain acts as a public chain providing transparency over the network, it retains the confidence associated with any other public chain, like Ethereum. The key benefit that Unification provides is by delivering a MainChain in conjunction with WRKChains. WRKChains are enterprise-oriented private chains, capable of operating a variety of functions, that are stemmed from the public MainChain, much like a smart contract. While smart contracts simply act upon if-then terms, WRKChains enable enterprises to build a private operation within a larger public ecosystem. This means that enterprises can build applications that tap into WRKChains without disclosing customer or proprietary data on a public network. However, cross-WRKChain transactions will be declared upon the MainChain, thereby facilitating an option to shed transparency on any operation that need should be easily accessible to external entities. This creates a dual-functionality with which enterprises can retain private data within WRKChain operations and can disclose data, that should be transparent, via the MainChain. Validators stand to earn a passive income from both block rewards and network fees. As the ecosystem will need time to acquire a wider adoption, the block rewards are extremely generous from the on-set of the mainnet. The block rewards slowly decrease year-by-year as Unification’s growth will ensure network fees offset the reduction in block rewards. 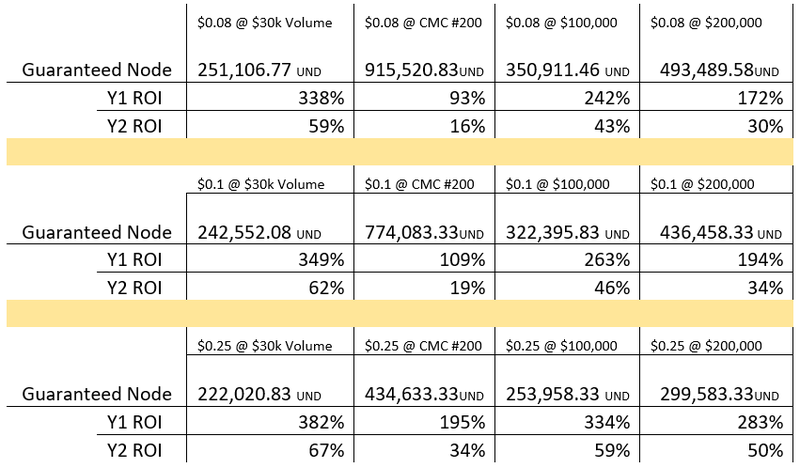 For simplicity’s sake, here are models displaying the ROI on UND validating nodes considering only the guaranteed block rewards and excluding any network fees. To earn the block rewards, a wallet must be in the 96 top holders. Alternately, holders can opt to have 1.042% of circulating tokens and guarantee themselves a spot in the top 96. The ROI on a node depends entirely on the amount purchased, be it a guaranteed placement or the minimum needed to be in the top 96. Given the incredible ROI for the current 96th holder, it is highly unlikely that 200 UND will suffice once mainnet is live. More reasonable estimates would be to account for guaranteed wallets at 1% or 2% of net supply. Even in such cases, the ROI on purely block rewards (excluding network fees) is incredible. The block rewards change each year and follow a descending curve. Rather than following a multi-level reward system within a year, the block rewards beyond the second year remain the same through out the year. The token economics get a bit more complex over time as each day new tokens are released. Calculating ROI is tough as simply knowing the block rewards isn’t sufficient. Now, each standing in the UND economy would stand to benefit to not purchase any additional UND and continue to reap the rewards. Were the demand for a UND node to remain low and only a small portion (2%) of net supply would be used in masternodes, UND would offer far higher ROI than any other major masternode available in the Crypto space. However, given the high ROI, it’s in people’s incentive to accumulate outstanding tokens to acquire a node. Thus, existing node holders would have to either hold on to their block rewards or even purchase new ones to maintain their spot. To add to this, Unification Foundation would be emitting small amounts of fresh tokens everyday via the Algorithmic Token Distribution (ATD). This is a novel form of token distribution in which the project will sell 3% of the day’s token volume on exchanges. This ensures the foundation has sufficient funds for years to come, thereby providing liquidity for ongoing project development. At the same time, even if validating nodes refuse to sell tokens in order to maintain their position, new entrants would have the opportunity to acquire tokens from the market. The token emission can vary by great bounds depending on token popularity. The present daily volume is about $30,000. Were the token to reach the same volume as a CMC 200 token (CoinMarketCap’s 200th position), the volume would be drastically different. Given that UND’s IEO hardcap is quite small, the project is starting off as a low cap and thus having the volume of a rank 200 coin is pretty impressive. Of course, the volume can be various numbers between the 200th coin’s volume and the current $30,000. Here’s a look at the dollar-value of the tokens that will be emitted via the exchange’s through the ATD. Depending on the price, the above dollar-value emission can mean the market supply addition of varying amounts of UND. A daily volume of $100,000 will lead to ATD of $3,000. This $3000 can mean 30,000 UND tokens if UND cost 10 cents, or it can mean 7,500 UND tokens if UND cost 25 cents. Here’s a look at the potential amount of UND that will be added to the supply in a year through the ATD, while taking into account various volumes and token prices. These tokens will be purchasable by anyone aiming to acquire a validator node. Given the data, a natural competition will ensue to acquire tokens for maintain a node. Thus, the ROI will vary depending on many factors, including the block reward, network fees, and UND token price. Only the block reward is predictable and therefore, to simplify the calculation, the model has been limited to one unknown: UND token price. Network fees will be considered zero and so the following ROI models are ultra-conservative as there’ll obviously be network fees. The above table calculates ROI (in terms of UND) purely on the basis of block rewards. It accounts for the amount of UND needed to have a guaranteed node at various prices and volumes. As the table only records ROI in terms of UND, it’s worth noting that absolute returns naturally increase drastically if the UND dollar-value appreciates. Thus, masternode holders have the best interest in helping the network grow as a higher price not only ensures the ATD leads to less token release, but it also ensures the fiat value of their holding increases. Of course, the nodes would also be collecting network fees; so, the efforts of the Unification Foundation to boost ecosystem growth could potentially multiply the ROI. Presently, the project has already landed a partnership which exposes the technology to 2 million patients. Further utilities like integrating unification’s WRKChains to government contracts are under consideration. Moreover, the project’s initial goal of data liquidity can also be integrated into the UND ecosystem. Thus, there’ll be plenty of network fees to be collected on top of the block rewards. This story is published in The Startup, Medium’s largest entrepreneurship publication followed by +439,678 people.